4Easysoft YouTube Downloader is the best YouTube Video Downloader, which can help you download videos from YouTube, Google Video, Yahoo Video, and many others video websites instantly. Also this YouTube Downloader allows you to convert downloaded videos or local FLV videos for iPad, iPod, iPhone, PSP, PS3, Cell Phone, Archos, Wii, Zune, Creative Zen and other devices. 4Easysoft YouTube Downloader is easy to use. Just specify the URL of the video you want to download and set the output video formats. Then click "OK", this program can download the video freely with super fast speed. You can preview the downloaded and converted video at the preview windows. 4Easysoft YouTube Downloader can help you download FLV/SWF video from YouTube and up to 150 other video websites. 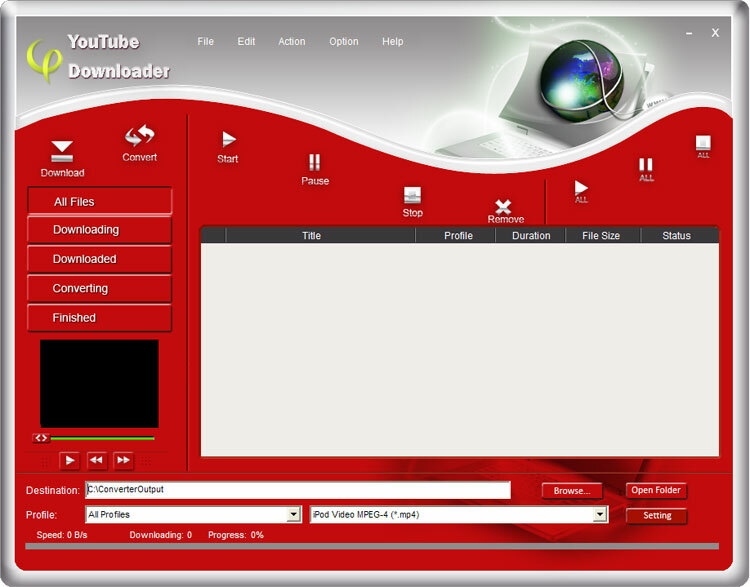 With this YouTube Downloader, you can download multiple YouTube video at one time so as to save much time. The YouTube Downloader enables you to convert the downloaded YouTube video to other video formats to play on your player iPad, iPhone, iPod, PSP, Creative Zen, Xbox, etc..
As the versatile YouTube Video Downloader, 4Easysoft YouTube Downloader can also help you convert the local FLV videos to other video formats you want. The YouTube Downloader provides you detailed parameters for you to choose including Video Resolution, Video Bitrate, Frame Rate, Encoder and Audio Channels, Sample Rate, Encoder, Audio Bitrate. The YouTube Downloader provides you with the function of preview the downloaded and converted video at the preview windows. The files status of downloading, downloaded, converting and finished are displayed clearly on the interface. 4Easysoft YouTube Downloader has the intuitive interface and advanced technology, which can help you download and convert YouTube video with fast speed and perfect quality.